Consider the screenshot pictured above of Grace Field House. It is our introduction to the orphanage — which we, and our leads later discover is a human meat farm — and it’s a sunrise shot framed by the nearby forest. There’s something a bit unsettling about having that much brush out of focus in the foreground, but the framing of the trees gives the scene a calm, pastoral feel. 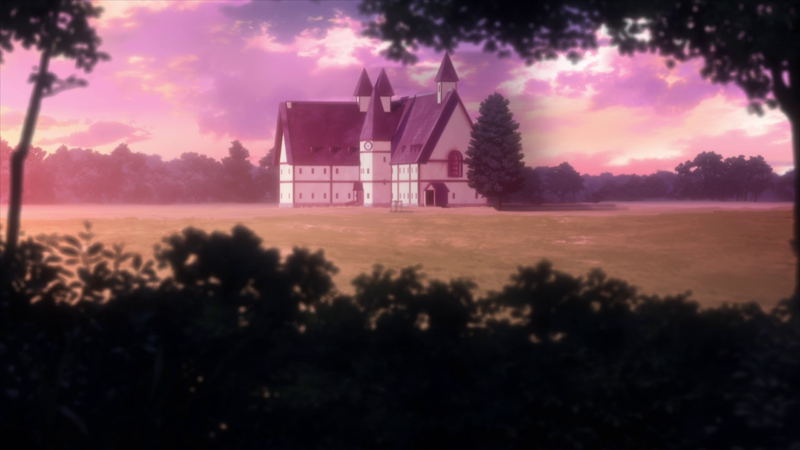 This is a near-identical establishing shot of Grace Field House in the third episode, well after there has been a notable shift in the lead trio’s perspective as well as our own as viewers. The lighting at sunset illuminates the entire house, but it’s far more ominous. Combined with other shots in this episode and Episode 2, it’s as if someone is watching from the forest. 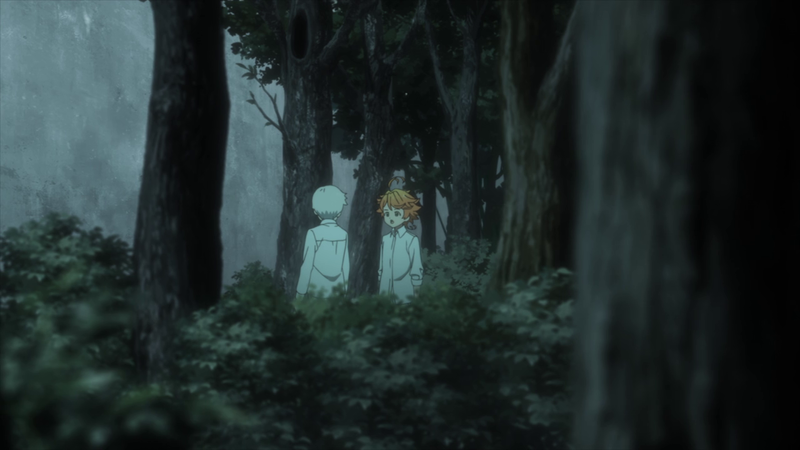 As early as the series’ premiere, The Promised Neverland introduces the forest almost as a character in and of itself — first as a location for the children to play tag. The shot above, like our first look at Grace Field House at sunrise, is slightly unnerving. 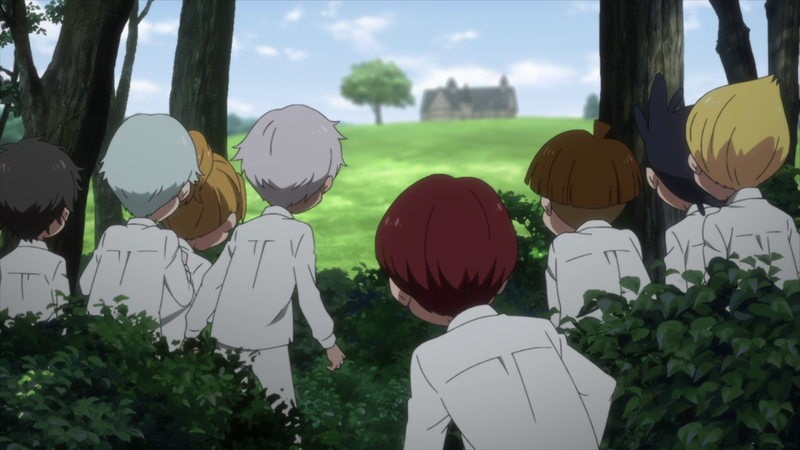 Despite the context being an innocuous game of tag where the children are watching the field and Norman (who is “it”) is approaching them from behind, there’s a sense that someone else is watching the children, even though we already know that it’s Norman who is behind them. 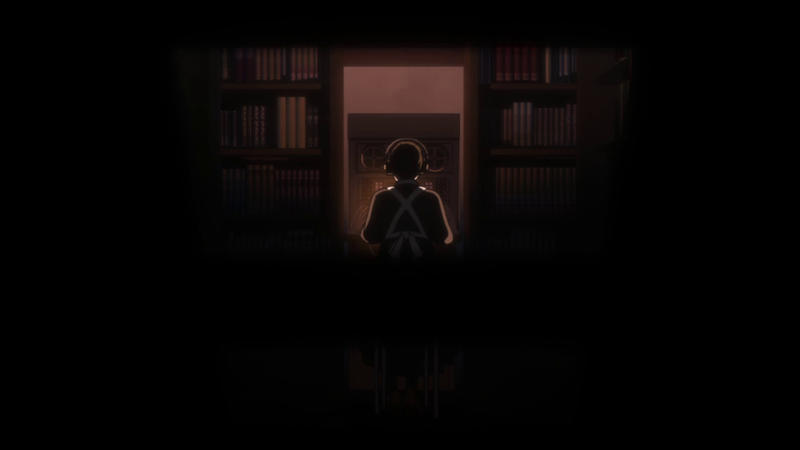 For a viewer unfamiliar with the manga and the true nature of Grace Field House, this makes the entire scene disconcerting despite not knowing the underlying horrors of the orphanage just yet. Later in the same sequence, Emma approaches the forbidden fence in the forest alongside Norman. 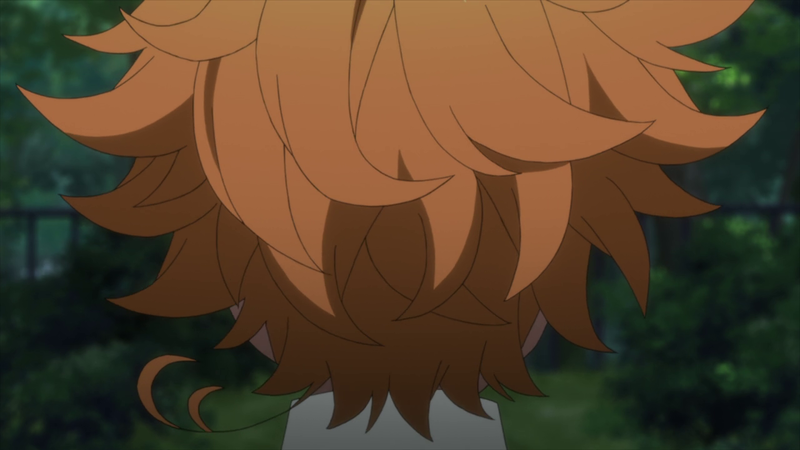 The camera pans around Emma’s head first, positioning behind her while she approaches the fence, as if someone is watching her. 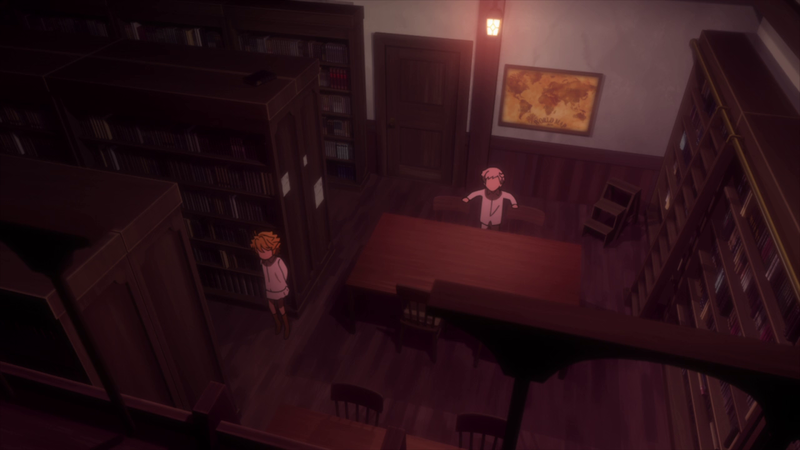 Changing focus between characters to highlight facial expressions, distance, or inner emotional turmoil is something that the camera of The Promised Neverland does frequently, even in a scene as simple as the children’s classroom tests. Here, the focus shifts from Emma in the background to a closeup of Norman’s face as both are staring at the fence. In context, this makes Emma’s walk up to the fence more unnerving. The focus on the back of her head implies that someone was watching her. Revealing that Norman was already standing at the fence to her left makes it clear that he wasn’t the one behind her. 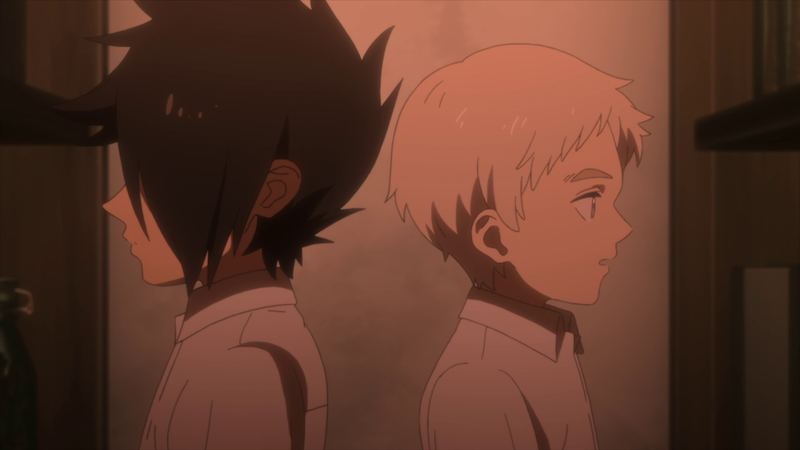 Episode 1 also uses shifting focus to separate the main trio. Until Ray confronts Norman and Emma in the second episode, he is separated from them by their shocking experience of discovering Conny’s living corpse and the existence of monsters. 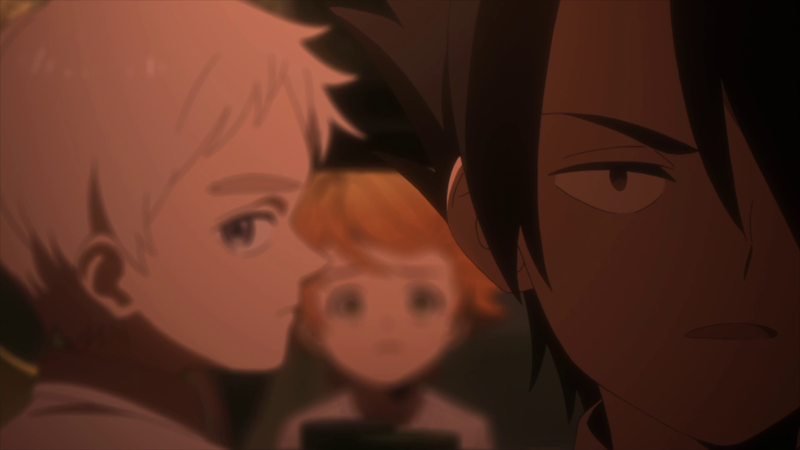 Ray is naturally skeptical of everything, and The Promised Neverland makes it clear from the opening scene that he already suspected that something was off about the orphanage, but this focal shift purposefully separates him from Emma and Norman following their recent revelation. 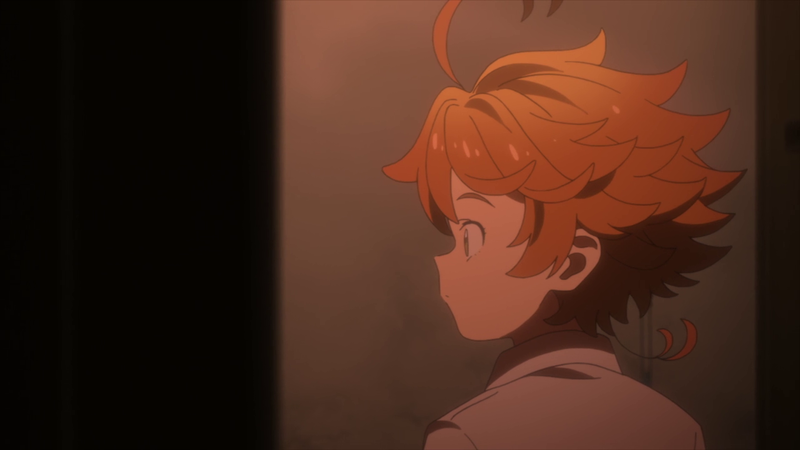 While the first episode hints that something is amiss through framing, camera positioning, and focus, The Promised Neverland‘s second episode makes it all the more clear that someone is watching, heightening Emma and Norman’s fear. The opening shot features the camera swaying back and forth above Emma’s head in time with a lighting fixture. Is someone watching Emma? Regardless of whether “Mom” or others are truly watching Emma in this moment or not, the framing immediately adds to Emma’s constant dread and anxiety. She has been betrayed by those she trusted most and is now on her guard at all times. 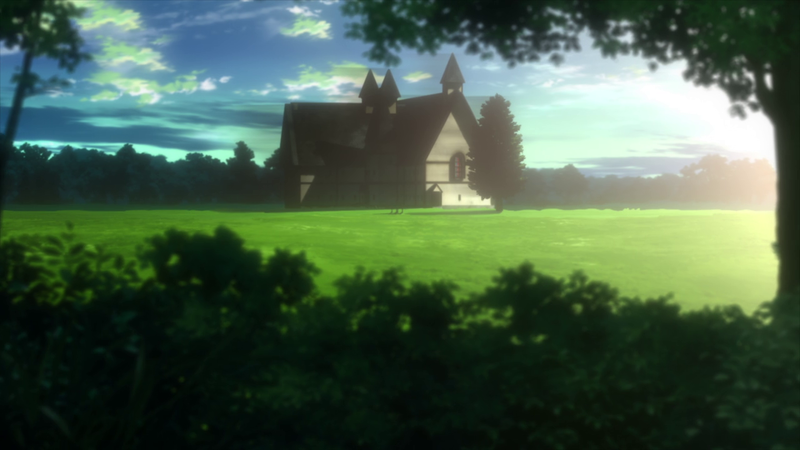 Episode 2 increases the amount of obstructed view and eerie establishing shots. 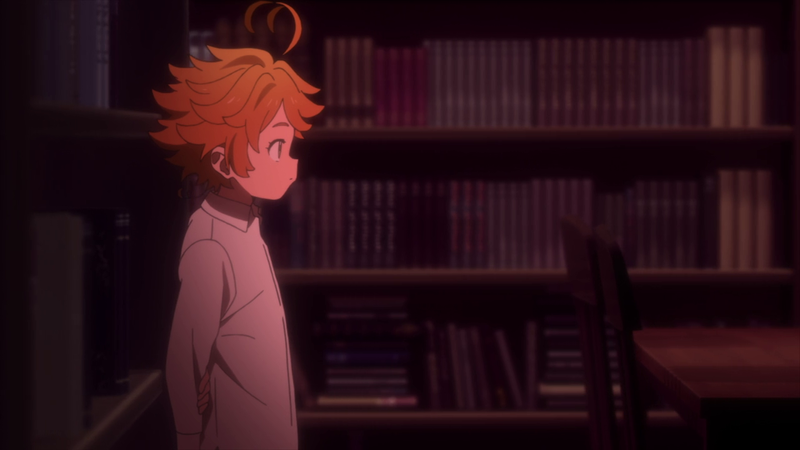 Since a most of the tension in The Promised Neverland comes in hushed conversations — the anime has opted to have characters voice many of the manga’s inner monologues — the series moves the camera slowly while framing Emma, Norman, and later Ray as if someone is watching from a distance. At this point in time, Emma and Norman are unsure as to how much Mom knows. 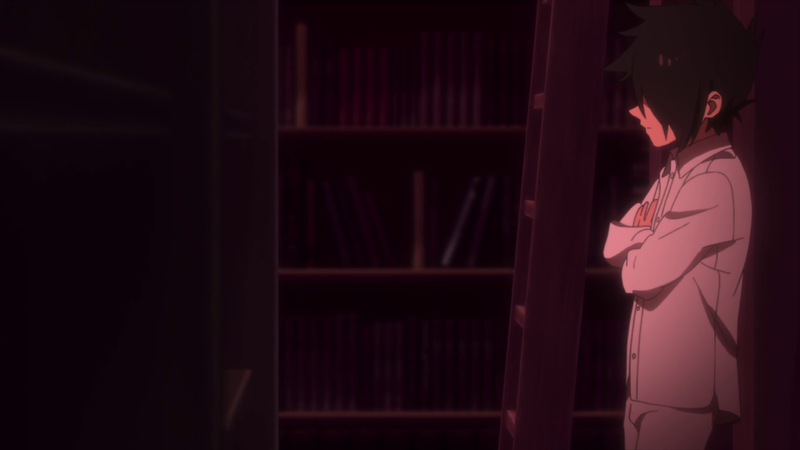 As the episode evolves, she makes it clear that she’s onto them, making the obstructed-view scenes even more suspenseful. 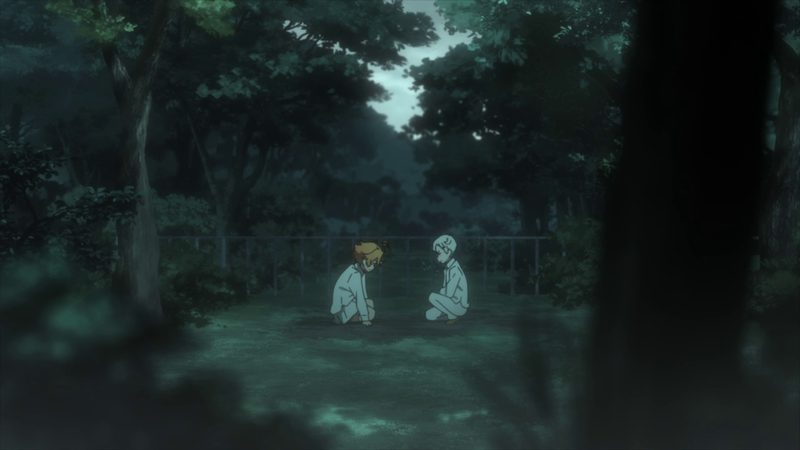 The Promised Neverland returns to the forest that surrounds Grace Field House. Emma and Norman are plotting their escape but the forest, or someone, is always watching. It frames their conversations while implying that they’re being followed — they also discover in this episode that they’re being tracked by Mom — and even with the revelation that it was Ray who followed them into the forest, these shots add unease and fear. With each small reveal, the camera’s positioning shifts slightly to keep tension high. In Episode 3, Emma, Norman, and Ray are introduced to two more threats to their plans. The first is the obvious arrival of Sister Krone. 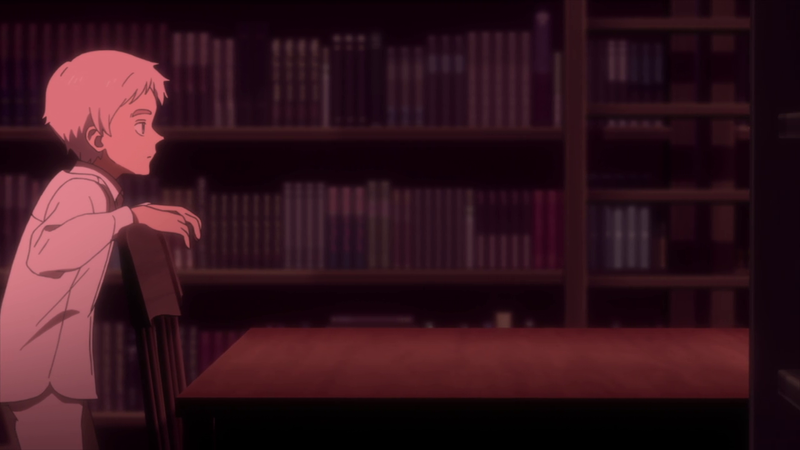 The camera follows the trio’s opening conversation, moving through bookcases as if someone is stalking them through the shelves. 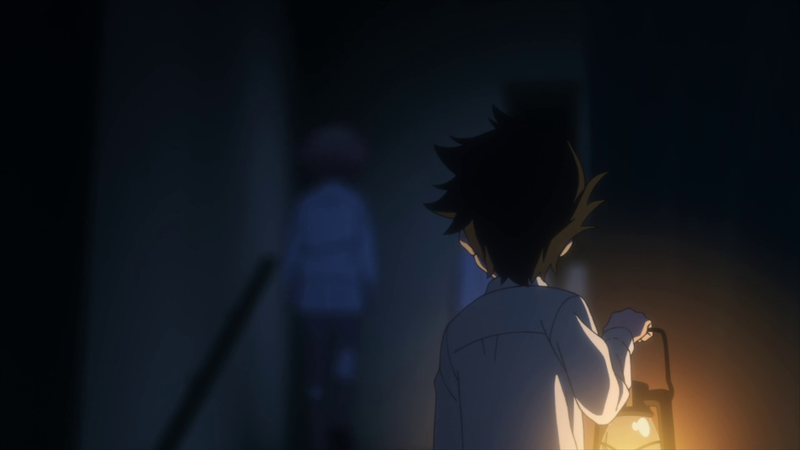 All three are separated, but Ray is facing in the opposite direction of Norman and Emma, deliberately separated even further. 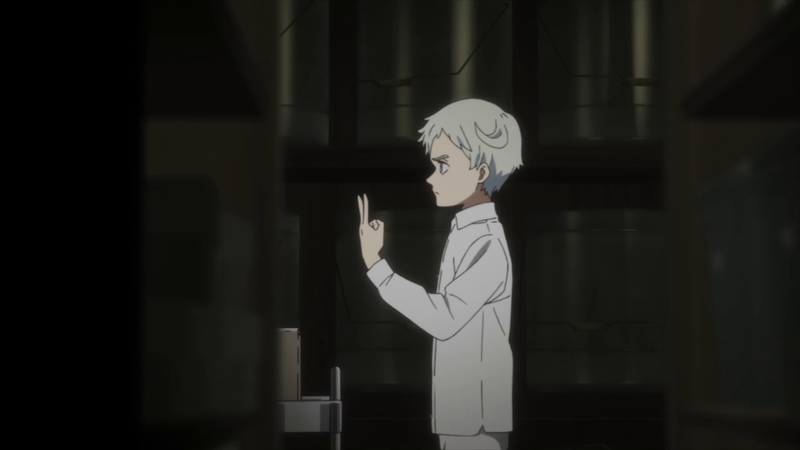 As the most blunt and pragmatic of the trio, Ray will often say what Norman already knows but refuses to say due to Norman’s feelings for Emma. This entire scene is bookended when the trio discusses the fact that there may be a traitor in their midst. 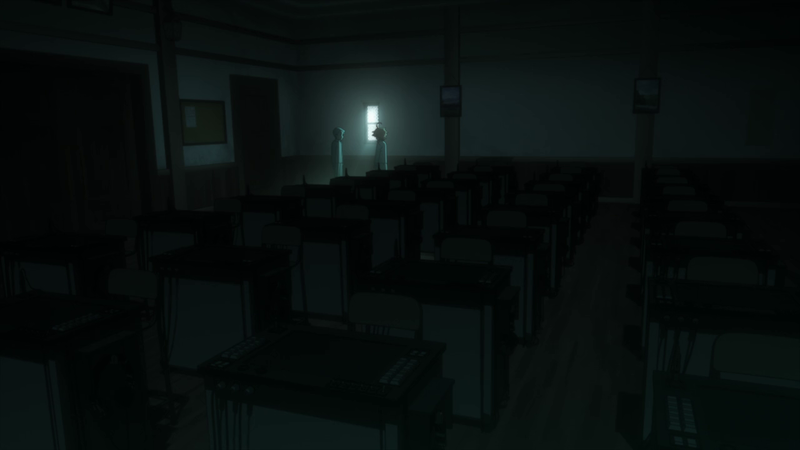 Ray and Norman are placed side-by-side, since they have already realized that there is an informant among the children who is reporting to Mom. Emma, who is loathe to suspect any of her family, is visually separated and has to be told by Ray. 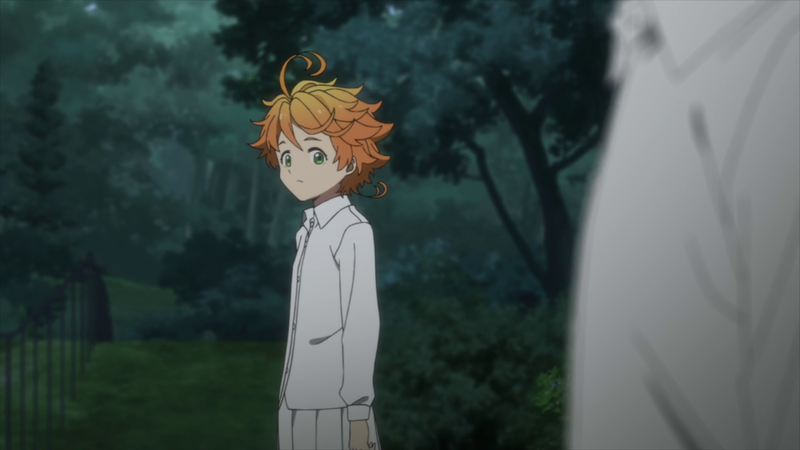 As Ray speaks, The Promised Neverland deftly uses focus to further distance Emma with Norman ever-so-slightly out-of-focus in the mid-ground. Norman loves Emma and doesn’t want to be the one to tell her, despite realizing that she needs to know. In both of these conversation scenes, the camera not only adds to the underlying fear of the trio, but separates them from each other as individuals. Obstructed views aren’t reserved for the children. 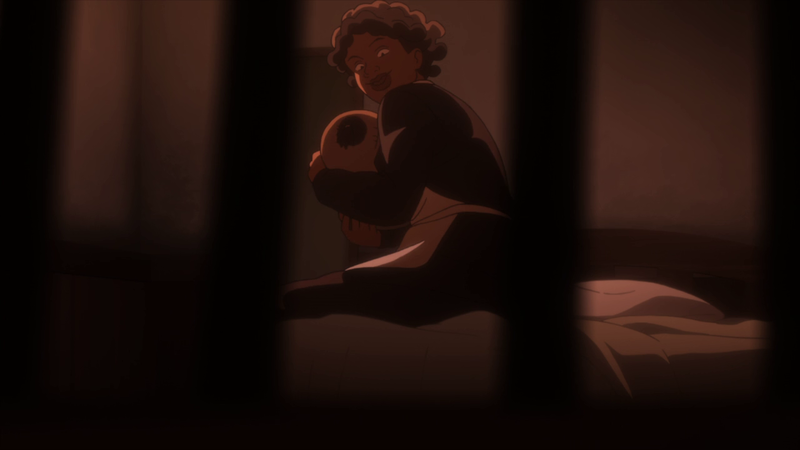 The Promised Neverland also portrays Sister Krone and Mom Isabella as if someone is watching them as well. 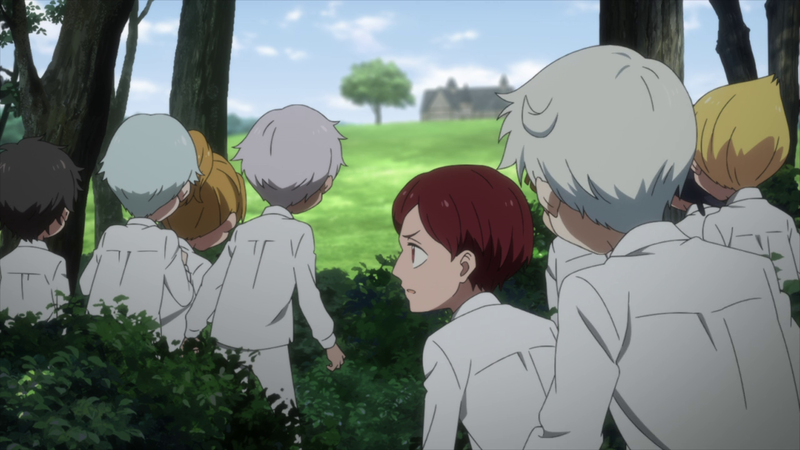 They’re implicit in perpetuating the system, yet they’re not truly safe from it, especially if Emma, Norman, and Ray succeed in their escape. 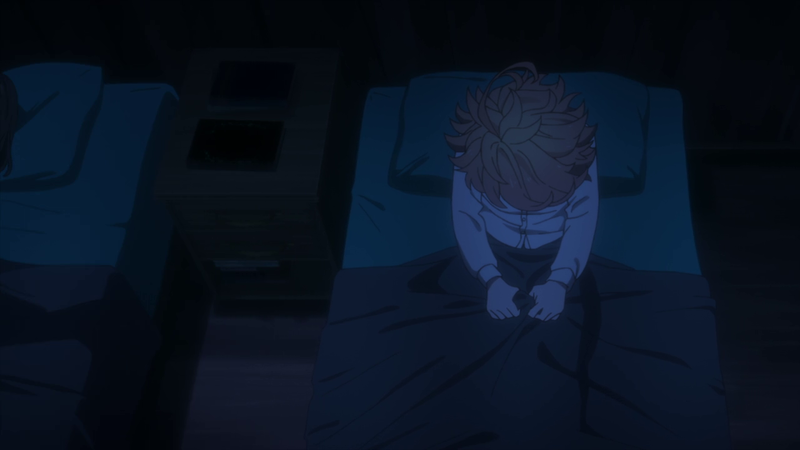 Throughout the first three episodes of The Promised Neverland, the series camera is always evolving while simultaneously sticking to shots that would easily be possible with a real-life video camera. This contributes to increased feelings of unease and dramatic tension while watching. Although the backgrounds are less-than-stellar and animation sequences are reserved for bursts of energy — like Sister Crone’s frenetic game of tag in Episode 3 — the cinematography is nuanced and purposeful. Really great post. 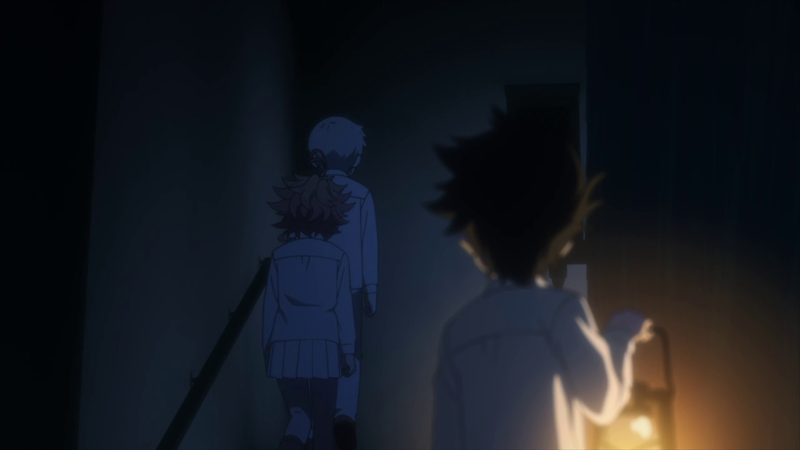 I’ve definitely loved some of the shot choices in The Promised Neverland so far and this really looked at some of the ways they’ve really worked at building setting and tone through the use of the camera. Nicely done.